This visual effect was a collaboration led by scenic designer Christopher Rhoton with properties designer, Jamie Karas and lighting by Andrew H. Meyers who provided ambience and visual depth using light and shadow. Every character was immediately identifiable in a diverse and detailed collection of costumes by Jesus Perez and Jane DeBondt (a/k/a “J2 Costumes) with hair and makeup by Alice Slazar, assisted by Becca Lauren. In this story, partially narrated by James Harms, the Witch (Michelle Jasso) promises to lift a curse put on the Baker and his wife that has left them childless but in three nights time they must bring her a cape as red as blood, a cow as white as milk, a shoe of gold and hair as yellow as corn. This task takes them into the woods. 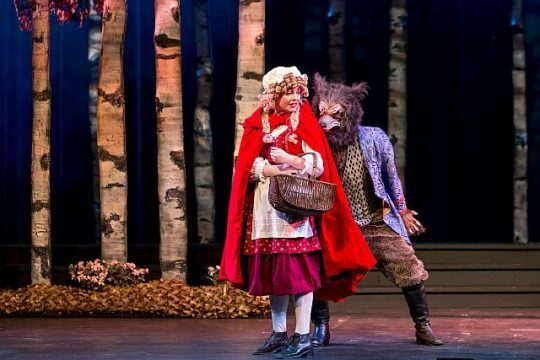 The cape must of course be gotten from Little Red Riding Hood (Cecilia Iole) on her way to Granny’s (Sara Stern) while being pursued by the Wolf (Benjamin Sprunger,) in one of the best wolf masks ever). The yellow hair will be found on the head of Rapunzel (Sarah Wasserman) in her tower. Cinderella and Jack will supply the shoe and cow. The Mysterious Man (??) offers clues in the form of riddles along the way. Cinderella’s family which includes her father (Bob Sanders), stepmother (Katherine Condit) and two step sisters (Caitlyn Glennon and Evelyn Finne) offer a considerable amount of comedy rivaled only by the two Princes (Maxwell J. DeTogne and Benjamin Sprunger) and the Steward (Anthony Whitaker). The voice of the giant is performed by Rebekah Rawhouse with cameos by Snow White (Rachel Wagner) and Sleeping Beauty (Teaira Burge) that round out the sizeable cast. This company is known for its top notch music with every actor in fine voice and mastering Sondheim’s challenging score. They are accompanied by an orchestra of fifteen professional musicians of the Chicago Federation of Musicians, Local 10-208, directed and conducted by Roger L. Bingaman. The show is very much “in the wheelhouse” of this company and director Rudy Hogenmiller who knows and understands classic American musicals. Hogenmiller knows how to lead an ensemble of this size and manage the technical production staff as well. Pacing is tight. Diction is clear with lines and songs well articulated. Stage movement (with the help of choreographer Clayton Cross) is purposeful and visually interesting. Sadly for the company, Hogenmiller will retire as Artistic Director effective January, 2020 along with General Manager Bridget McDonough. But their influence and legacy will no doubt be obvious for many years to come. In a production where everyone has contributed equally, living up to the best of their ability, it is difficult and unnecessary to single out any one performance or performer. I have always thought that when done correctly theater is the best team sport allowing each person to shine while working for the good of the whole. In this regard, you are unlikely to find a much better rendition of “Into the Woods” than this one by Music Theater Works. Though the producers suggest that it is recommended for 8 or older, Act Two takes on a darker aspect with more adult themes which makes this appropriate for less sensitive children probably 12 or older. Its run time of two hours and forty-five minutes (with one intermission) might also make it less appropriate for very young audience members. Details: “Into the Woods” is at the Cahn Auditorium, 600 Emerson St., Evanston, through Dec. 31,2018. For ticket and other information call (847) 920-5360 or visit Music Theater Works.